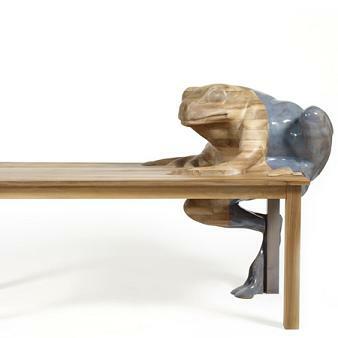 The ‘Frog Table’ by Dutch designer Hella Jongerius is an eye catching furniture piece that conjures up either humour or mild disgust. 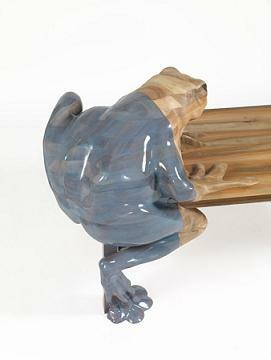 The table itself is made from solid walnut wood whilst the frog is partly coated in blue transparent enamel. 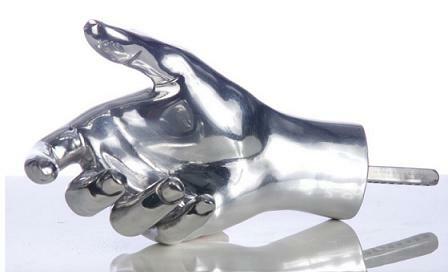 It’s currently being shown at the Galerie Kreo in Paris until the 30th May 2009. Hella Jongerius has become a name in the design field for the way she merges and pushes the boundaries of handicraft and industrial techniques. 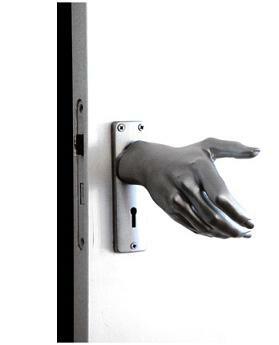 Through her explorations, a narrative often evolves into her work; stories seem to hide underneath the skin of products. The crossing of boundries is key to her work. 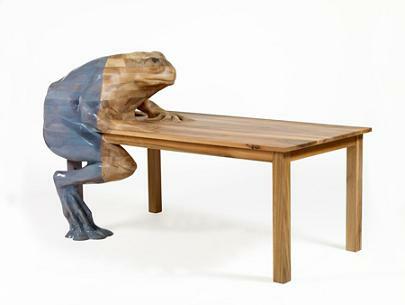 The table is no longer a table but a frog but you can still eat dinner on this frog, or is it a table? Her exploitation of coincidences and even mistakes has led to the wildest of ideas and concepts. Sharpie Marker Pens are usually employed in the humble design area of cartooning, poster design and autographs. Some have even coloured a few wigs with it, however, now it seems it has been taken to a whole new level. 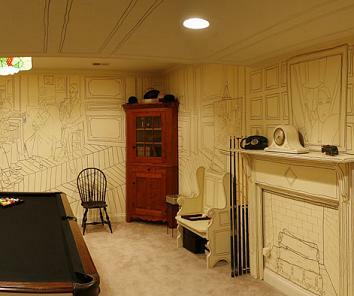 A man from the city of Lexington in Kentucky decided to design his basement walls with a Sharpie-drawn mural. Just ten dollars worth of the popular pen were needed to complete his epic endeavour. Charlie Kratzer, 53, the associate general counsel for Lexmark, started working on the project when he was faced with rather insipid cream walls that did little for the aesthetic ambience. Rather than coating the walls with white paint, he set about using his natural creativity to first improve a small section of the room, and later, with the artistic juices flowing, the rest. 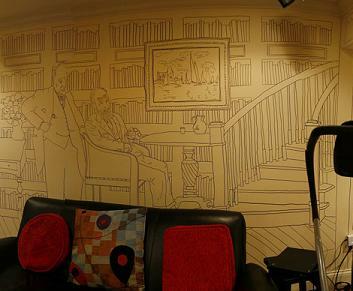 The main theme of the mural is a replica of his upstairs library with added notable figures from history. These include Sir Winston Churchill in conversation with George Bernard Shaw; fictional detectives Hercule Poirot and Sherlock Holmes; the TV squirrel Rocky and his moose friend Bullwinkle; and also William Shakespeare. Poking their heads around a corner are the Marx Brothers whilst Joan Crawford rests in a chair. At the doorway to the basement is a drawn image of the Impressionist artist Claude Monet, a figure of admiration for Kratzer who sees his own art work as a tribute to the great painter. Pablo Picasso is another influence on the Kentucky lawyer, with one entire wall of the basement given over to a scene from a gathering at Picasso’s Paris salon in 1919. Also present on that wall are musical, cinematic and literary greats including Jean Cocteau, Erik Satie, Clive Bell and Olga Picasso. 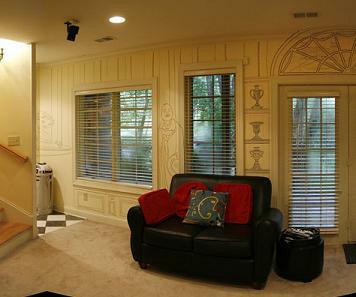 To see another Sharpie artist visit the website of Justine Ashbee. What do you do when you have an assortment of mismatched glassware pieces taking up space in cupboards and attics? Well, you could try sandblasting them followed by a good frosting which is exactly what product designer Michelle Ivankovic did. 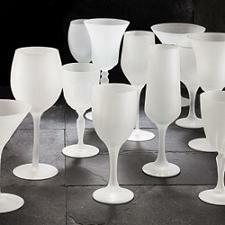 Ivankovic, who is also the senior product designer for Umbra, hand selected the wine glasses and after the frosting procedure was completed, has sold each in a batch of four for around $70. Some have been surprised that Umbra, who describe themselves as “the worldwide leader in original, casual, contemporary, affordable design for the home”, have bothered to do this small profit procedure. Nevertheless, it has proven extremely popular and it seems as of writing this article, they are out of stock due to high customer demand for the frosine glasses.